I’ll always remember the first time I saw my son cry from joy, sentimentality and compassion. You know, happy tears, basically. He’s eight, and he has cried plenty of times out of frustration, anger, tiredness and grief, but never like this. We were sitting in our hotel room in Hoi An, at the end of a two-week Hands On Journeys trip through Cambodia and Vietnam. 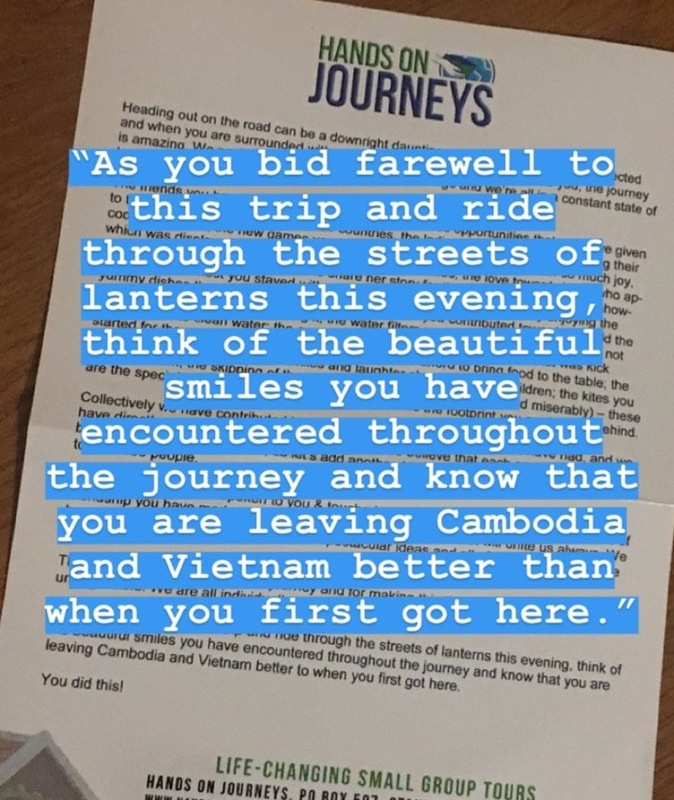 We’d been lucky to have Hands On Journeys founder, Simla Sooboodoo, travelling with us, and for the last night of the trip, she’d written us all a beautiful farewell letter, describing some of the amazing experiences we’d all had together. A trip with Simla isn’t just a sightseeing trip – it’s also a showcase of amazing chances to give back to local communities, where Sim’s been working for years in small villages you wouldn’t normally encounter as a tourist to empower the locals to help themselves. But back to the happy tears. My son asked me to read Simla’s letter out loud (it was kind of long, for an eight-year-old). By the last paragraph, he was sobbing. I asked him why (thinking there were all sorts of reasons and the most likely was that he was sad about saying goodbye to everyone) and all he could say was, “It’s so nice. It’s too nice!” Happy tears. 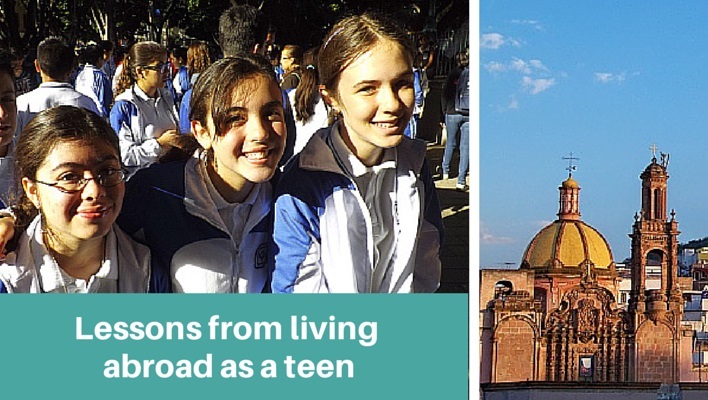 I think travel accelerates personal growth and development for all of us, but judging from our recent experiences, when you’re eight years old and already fairly experienced with the nuances of travel, then new travel experiences can accelerate your personal growth exponentially! 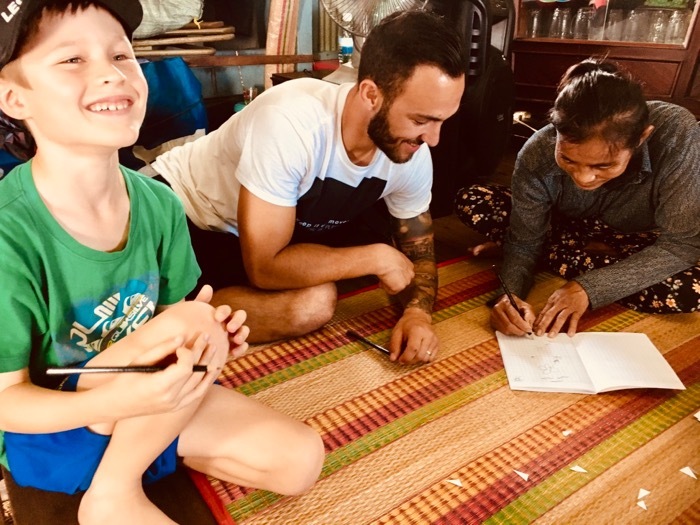 My eight-year-old’s experiences in Cambodia and Vietnam, including the sightseeing, the special group of people we got to travel with, and particularly the visits we made to projects where Hands On Journeys is helping to empower local communities, have changed him. During the trip, we visited a small village near Siem Reap where the grandmother of the village, Yeay, told us her life story, including her experiences in the times of the Khmer Rouge (scarily recent – it was actually still happening when I was born). She lost ten of her fifteen siblings to the Khmer Rouge and until the week we visited, she had never talked about her story, not even to her own daughters. We spent the day with her community, cooking together with the women, learning dancing from the children, and playing soccer with them on their ramshackle soccer pitch, which had extra degrees of difficulty thanks to uneven ground, overgrown grasses, wonky goals made from tree branches and a muddy ditch to clamber across to reach it. My son excitedly joined in the soccer game and proved to me (and himself) that you don’t need a fancy soccer pitch to have fun. A few days later we travelled to a larger village on the outskirts of Phnom Penh, where many of the inhabitants don’t have access to basic sanitation and safe water. As our bus pulled in, my son froze and said he wasn’t getting out. He was scared of this level of poverty, I think, and it being a larger group of people passing by and looking into our bus, and perhaps, quite simply and probably quite rightly, his eight-year-old grew-up-in-Australia brain didn’t know how to deal with this situation. 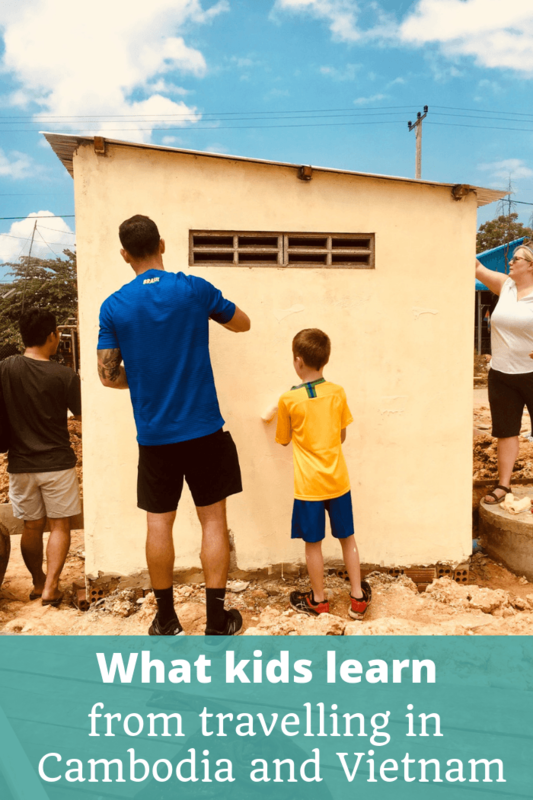 Eventually, it was his fear of missing out that won the day, and we joined the rest of our group to help paint a toilet building we had donated for one of the families. We met the mother of the family, a woman exactly the same age as me, and saw where they were currently sleeping. It was confronting enough for me to imagine people living in these very basic shelters, but no doubt at eight, it was even more shocking – to compare a woman the same age as his mother and see how different our lives were. Even though this was a difficult day for him at first, when I asked him at the end of our trip about his favourite experience, much to my surprise, this day was the one he picked. In the Vietnamese border town of Chau Doc, we also spent time with a small group of local women who live on house boats. They rarely are able to get any income – sometimes they can sell things or do a little work but living on a houseboat means you can’t even grow much to sell, and life is pretty tough. 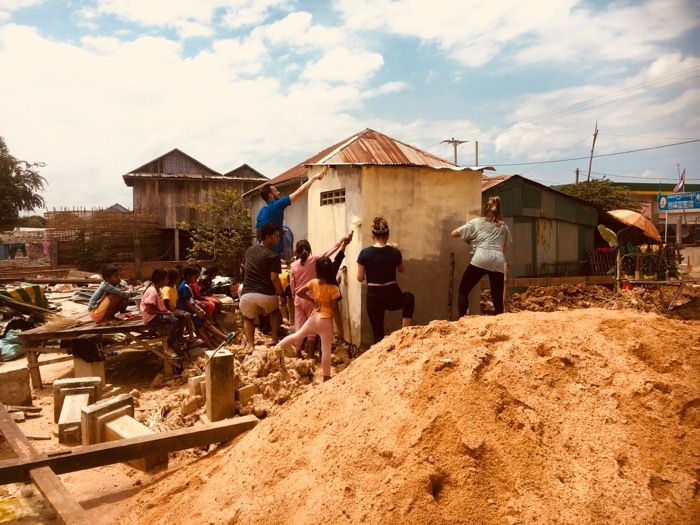 They also had basic hygiene and water safety issues – although we were hosted in one of the most well-off homes, their toilet was still literally a hole in the bottom of their floor going straight into the river. They had a water filter which Hands On Journeys had previously donated, and we boated around to donate some more new water filters, but it’s difficult to realise that there are still other families there who simply get a big container full of brown river water and let it sit for a few days and scoop the relatively “clean” water off the top to drink and cook with. We spent the morning helping the women work on their new business, designing greeting cards to sell to tourists. Most of them were essentially illiterate and hadn’t ever spent much time with a pencil in their hands – but my son loved showing them how to draw and paint better, and I loved seeing how enthusiastic they became. I can’t wait to see where they are in six months or a year’s time – the hotel we stayed in already agreed to stock their cards and being able to create an additional income from work like that would be life-changing for them. Don’t get me wrong, he’s still a privileged, Australian-born eight-year-old boy who desperately wants an expensive Lego set for Christmas, but he is a nonetheless a slightly different boy from the one who left Perth to fly to Cambodia a few weeks ago. I asked him this morning what the luckiest thing about being born in Australia was. His answer, quick fire, was “that there haven’t been any wars here and pretty much everyone has enough money to have a house and food”. We didn’t talk about this explicitly on the trip so I know these are conclusions he’s drawn himself; he was also quite affected by hearing about the Khmer Rouge and seeing the Cu Chi Tunnels in Vietnam, enough to realise that war and other conflict is not all fun military equipment but is also something that disrupts people’s lives significantly. It’s not all about having more Lego! When we chatted about the villages we visited, he said one good thing about living there would be there were always lots of other kids to play with. Personally I loved that they were great at making their own fun with very few resources, a skill that is lost to a lot of Aussie kids, I’m afraid, thanks to technology. 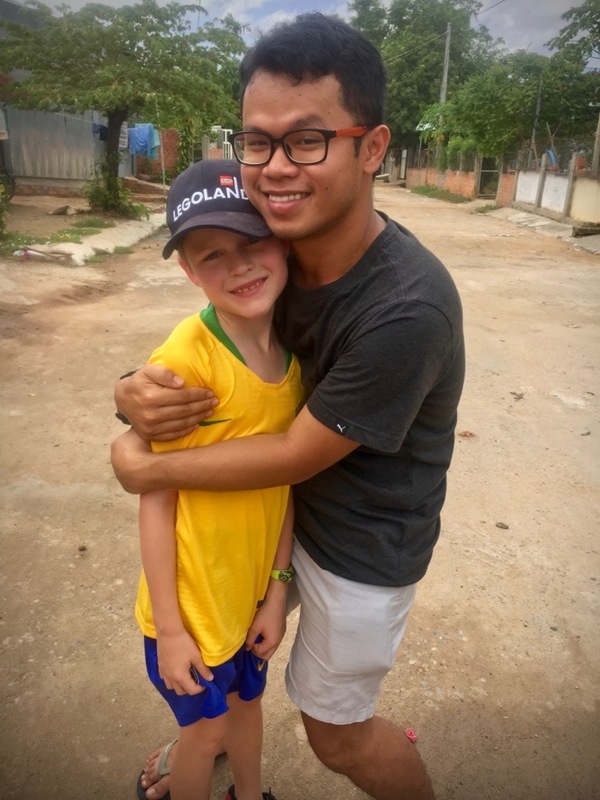 Even though he’s basically a shy, quiet kid, I adored watching him build close relationships with many of the fellow travellers in our group and especially our gorgeous Cambodian guide, Cham, who gave him a hug on meeting him the very first minute and looked after him carefully all the way through. 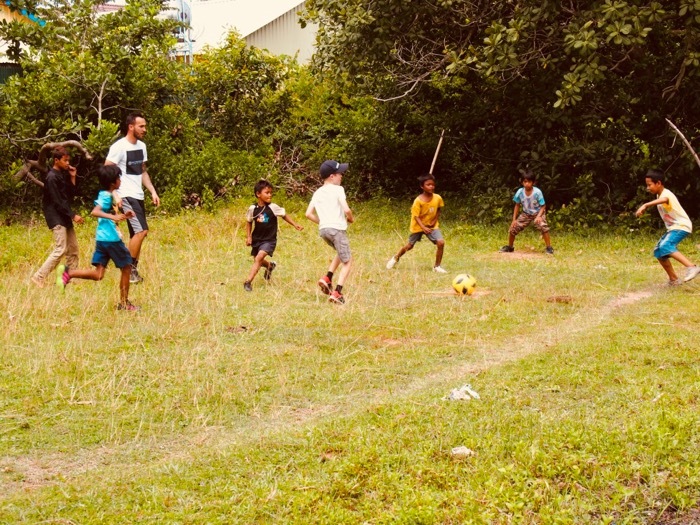 It was also great to see him reconnect with Simla and Luccas who we’d travelled with in Fiji, and deepen those relationships with awesome people. And to come full circle: he has learnt so much about compassion, about how best we can help others, about the reality of the world (without terrifying him too much, I hope! ), and he has cried happy tears about the results of all this. We cried together a couple more times as our trip came to a close, sad that it was ending and sad to say goodbye to good friends. Call me nuts but I think this is an awesome skill for an eight-year-old boy to have and it makes me proud. The disclaimer bit: My son and I were guests of Hands On Journeys but our opinions are 100% our own. I only work together with organisations who match the values of my blog and podcast. What an amazing thing for him to have experienced so young. It brought emotional tears to my own eyes, knowing how much kids absorb when they’re out of their own comfort zones and away from home comforts. I was also really touched that he now gets that the glorified war and battle scenario that most kids of his age are familiar with actually has a community toll. Hearing that first hand has given him that now for life. (I was well into my second decade before I heard and really listened to how guns ‘hurt people and make families sad’). Thank you so much again for sharing. Thanks Lalla! Yes – the war thing was/is so important. I know he’ll still run around playing pretend wars with his mates but at least there’s something inside him that knows it is not all fun and games.